The weather is changing quick in Las Vegas. We've had several days in the 80's and almost hit 90 last weekend. 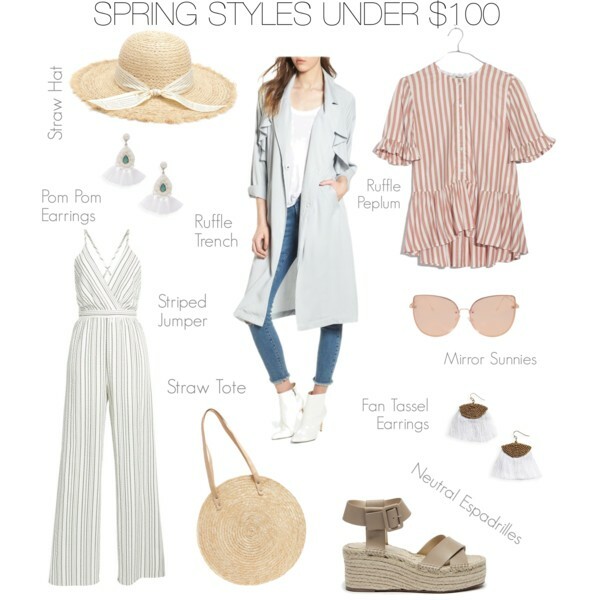 So, with the changing of the seasons, I thought I'd share a few of my favorite finds for Spring, most of which are under $50 but ALL are under $100. Straw hat - I love the fringe and bow detail on this one. And you can't beat the price. I purchased this one last year and wear it all the time. Statement Earrings - I've been eyeing these pom pom earrings and these fan tassel earrings. I love white and they can dress up even the most simple outfit. This peplum hem top with ruffle sleeves is so pretty and is THE perfect shirt to wear with jeans. See it here in black. This ruffle trench is the ultimate spring jacket. It's super soft, lightweight and a beautiful powder blue color. I own this already and have loved wearing it layered in the colder weather but will continue to wear it in Spring with a cami underneath. The straw tote, an ultimate Spring and Summer staple. I like this one for under $50. This one is also cute, with handles instead of straps. Neutral Espadrilles - These espadrilles are my all-time favorite. I own them in the taupe color pictured and can wear them with almost anything. The heel height is perfect (2.5 inches). New this year is a pretty rose blush color (also comes in black and cognac). These Mirror Sunnies are super cute. I love the blush color (never gets old), and I'm a big fan of the kitten style. These pair with pink lenses is also super cute and affordable. This striped jumpsuit is very on trend for spring. I have my eye on it, too. Loving the crisscross back tie. OOh yaas! Love that peplum top and straw bag! Hello Beautiful Spring weather! Can't wait for it to get sizzling hot haha. Ok maybe just sorta hot. I am literally obsessed with all your choices! I especially need those pom pom earrings!